so. it’s a friend’s birthday and i thought i should make her a gift. (runner up was sheldon, by the way). this particular friend works a real job and wears lots of real job clothing, which includes much black and white. an aside. when a friend from knit one cleaned out a bit of her yarn stash, it included a ball of great big sea. i tried to get her to keep it, but she is making a cardigan and this particular skein was just a different color than the rest and so she wanted it out of her house, so i benefited. thanks julie!! anyhow, birthday meets gifted yarn and you have this scarf – the perfect accent for my friend’s work clothing… and here’s the little pattern in case you have one of those sorts of jobs. use a yarn that is silky, shiny, drapey at about a dk weight and size 7 needles. i used about 110 yards of great big sea, did 36 repeats, and ended up with a scarf 64 in. long by about 3 in. wide. if you chose to use a different weight yarn, use a needle size one size above that recommended. i wouldn’t go much larger than one size above since you want those nice garter stitch ridges to show up well. make it as long as you want, ending with two knit rows. block lightly by soaking in room temperature water for at least 20 minutes, rolling it in a towel to remove excess water, and laying flat to dry. 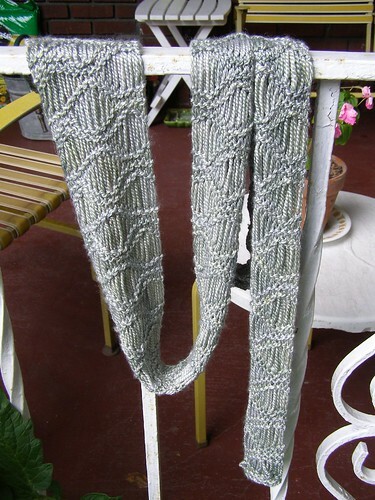 This entry was posted in cosyknitsliterally, free, knitting, patterns, scarves by cosymakes. Bookmark the permalink. That scarf is perfect for the business type friend. She’ll have lots of use for it. Very nice! Beautiful – you friend is lucky to have it. I have cast on for this this very morning using some gifted Bamboo yarn from a swap. It is going very smoothly and I think is the perfect fit for the variegated yarn. Thank, Cosy!! Saw your pictures on flickr. Had to check out your blog! Love all your hats! Your a true knit talent with a special gift for hats. I’m still trying to learn how to knit, till then I’m into crochet and love to make hats too. Definitely comming back again. Good luck. I keep ogling such scarves, and every time I see one I think to myself, “I have to cast on for one of those some day.” So you know what? I’m going to hunt down some good yarn, and I’m going to cast on tonight! yay! i am a very lucky girl. i adore the scarf, and it’s very very soft. I am making the spin-off morning waves scarf out of some lace weight boucle, and it’s taking forever. This similar and simplified pattern was just the thing to satisfy my urge to finish. You can see my project on Ravelry. Thanks for posting it! Thanks for the scarf pattern. I’m making it in silver and having a great time. I love it. 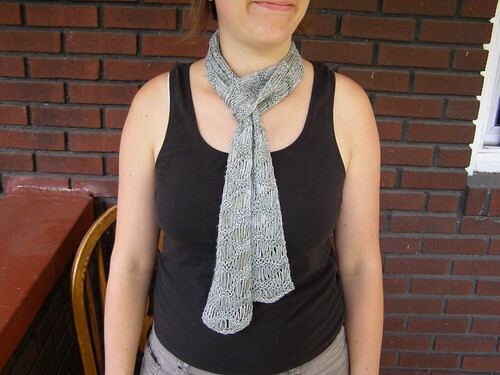 I ran into your blog randomly looking for a dropped stitch pattern for a scarf. I’m trying this now, but mine is not looking like yours. I feel like it may be possibly row 6 that I’m not understanding. I’ve knit 8 rows and 1 side is all garter ridges and the middle and other side have the dropped stitches. Does the repeat in row 6 start after the knit 6 or before? Thanks for your help. I don’t have a blog just email. I love reading blogs, there are so many talented people out there, including yourself. What does “k dropping all yos for all remaining rows mean? Do I just knit row 1?